Today I am featuring an artist which many of you, like me, will have not heard of before. He, you will discover, had an artistic connection with my last featured artist, Francesco Hayez. He also had another thing in common with Hayez. He had a fervent belief in Risorgimento, the resurgence of a unified Italy. The artist in question is the Italian nineteenth century painters, Domenico Induno. Domenico Induno, who had a younger brother Gerolamo, also a painter, was born in Milan in May 1815. 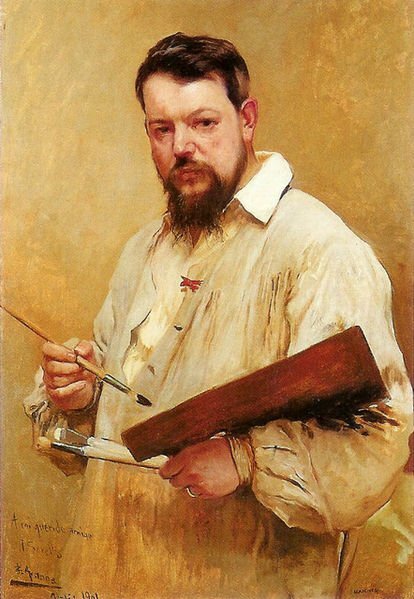 He began working as an apprentice goldsmith to Luigi Cossa, who, in 1831, convinced by Domenico’s burgeoning artistic talent, persuaded him to enrol on an art course at the Brera Academy of Fine Arts in Milan. 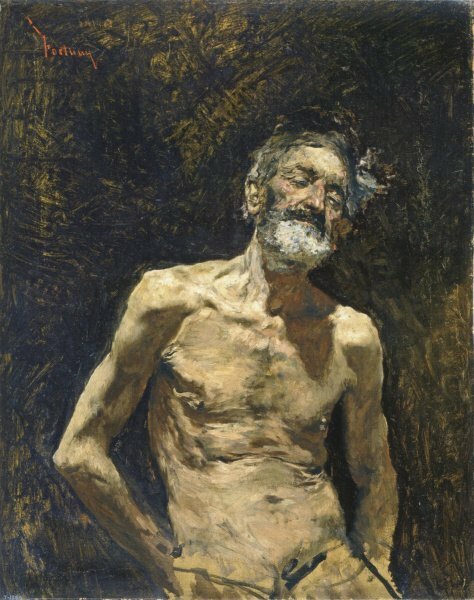 Whilst at the Brera he studied under the Lombard sculptor, Pompeo Marchesi and the Italian artist and professor of painting, Luigi Sabatelli. It was also at the Brera that Domenico Induno studied under Francesco Hayez who had been teaching at the establishment since 1822. Hayez was a great influence on Domenico and even allowed Domenico to have a studio in the Hayez residence. Hayez was also able to help Domenico to progress with his artistic career by introducing him to the leading Milanese art dealers and collectors. It was through the influence of Hayez that Domenico initially concentrated on depictions of biblical stories and depictions of ancient history. Like Hayez, Domenico was a great believer in Risorgimento (Italian Unification) and he and his brother, Gerolamo, took part in the 1848 Cinque Giorante uprisings in Milan. (see the previous blog with regards Cinque Giorante). 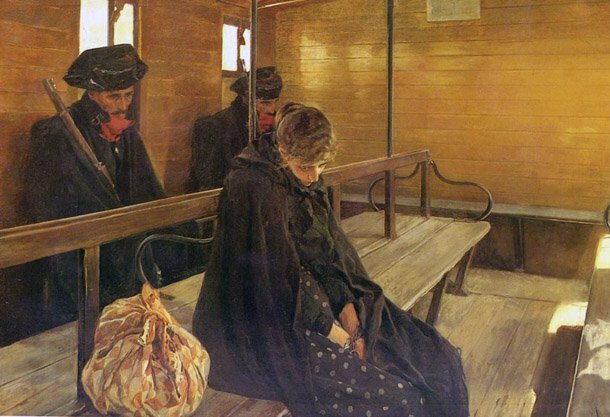 After the failure of the five day uprising and maybe because of their involvement, the brothers went into voluntary exile, initially travelling just across the Italian-Swiss border to Astano in Switzerland where they stayed with a fellow artist Angelo Trezzini and his sister Emilia, later to become Domenico’s wife. 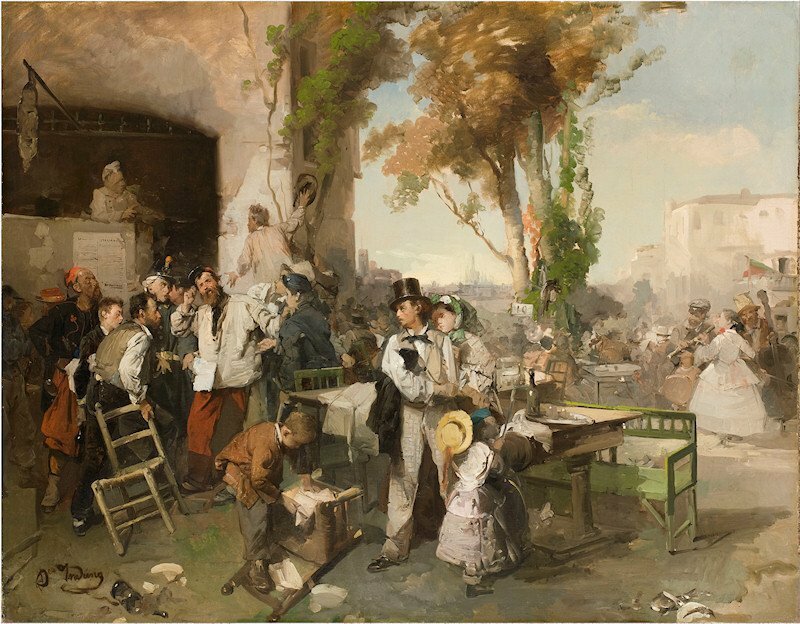 Trezzini had also been a student at the Brera Academy of Fine Arts from 1844 to 1846 and had served his apprenticeship in the same studio as the Induno brothers. From Astano Domenico Induno moved to Florence but returned to Milan at the end of 1859. Domenico now concentrated on genre scenes with their powerful depictions of the everyday life of the common folk and the world of the lowly and poor. 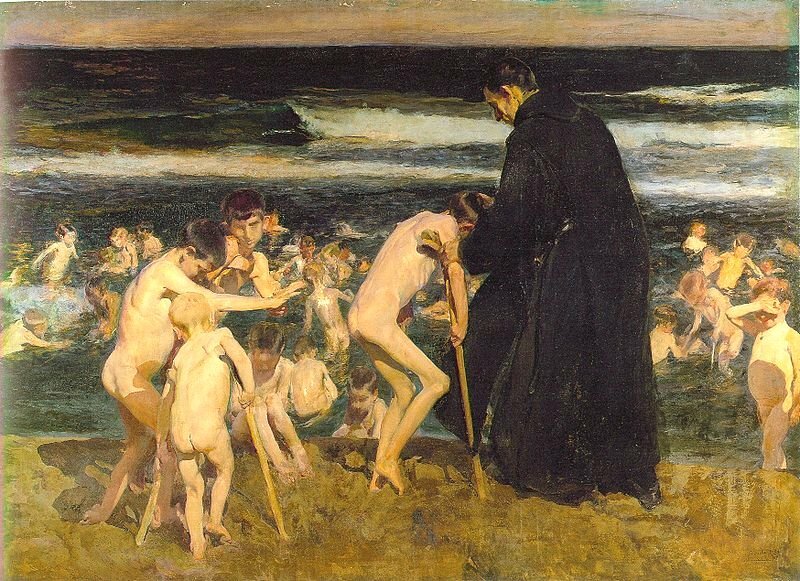 He began to participate regularly in the Brera exhibitions and those held by the branches of the Società Promotrice di Belle Arti in Florence, Turin and Genoa. One of his most beautiful and most moving paintings of this genre was one which he completed around 1854, entitled Pane e lagrime (Bread and Tears). It is a depiction of suffering and there is an emotional beauty about this work. Yes it is a depiction full of sentimentality and to some it would be denigrated as being mawkish and syrupy but for me it is a painting which depicts the reality of life for the less fortunate. The setting is a small stone-walled room. The woman, the mother of the child, is crying as she sits on the bed. The fire remains unlit and we can tell that the room is cold as on her knees is a muff or hand-warmer which she has been utilising in order to keep her hands warm. Look at her facial expression. It is one of unhappiness. It is one that makes us believe that she is almost about to give up on her life. She is distraught and despondent with her “lot in life”. She looks to a framed picture on the wall, probably a religious work. She is beseeching help from the subject of the painting although we are aware that none will be forthcoming. Before her stands her child clutching a piece of bread, probably the only food he or she has been given. The painting was bought by Francesco Hayez, who presented it to the Brera in 1854. The following year it was exhibited at the Exhibition Universelle of 1855 in Paris and in 1891 it appeared in the Induno brothers’ retrospective exhibition in Milan. Another of Domenico Induno’s paintings came up at the Christies London auction in June 2006 and realised £60K, well above its £18K-£25K estimate. 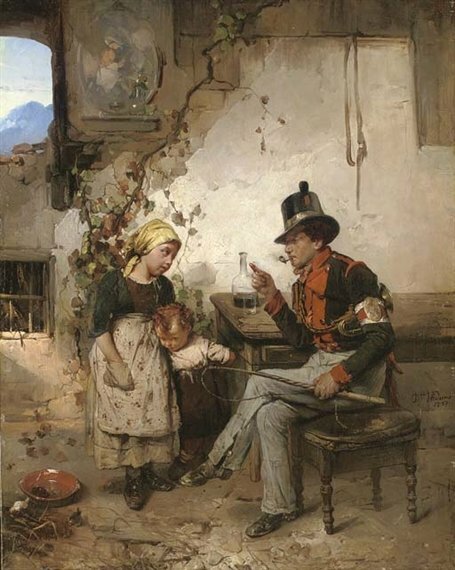 The painting is entitled The Post Boy and we see the main character sitting and relaxing at a table outside a house or inn. In his left hand he holds his whip with which he controls his horse and carriage and tucked under his left arm is his bugle sounded when he and the post has arrived in town. In front of him are two young children, the elder of whom , a girl, is listening to his stories, whilst the younger hangs on to her apron. On the floor we see some small fowl pecking away at some food. 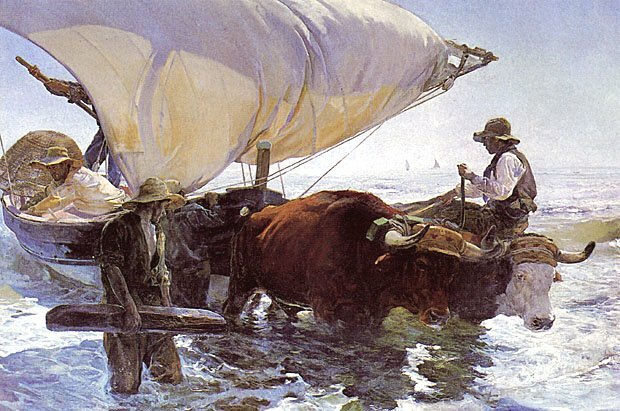 Domenico Induno completed one such painting in 1862. It was entitled L’arrivo del Bollettino di Villafranca (The arrival of the bulletin of the peace of Villafranca) and can be found in the Museo del Risorgimento in Milan. The painting was hailed as a great success and was purchased by Vittorio Emanuele II, the king of the unified Italy. He bestowed on Domenico Induno an order of chivalry known as a Knight of the Order of Saints Maurice and Lazarus. There were a number of versions of the painting by Induno but all have one thing in common. It was all about the people. It was no grand history painting depicting the witnessing of the agreement between the two emperors. Induno had once again shown his desire to express the importance of the common people who had had to endure war and now could relax and enjoy peace. The setting is outside the door of an inn where the reading of the bulletin about the treaty is taking place. The ordinary people of Villafranca gather around to hear the news about the treaty and the ending of the conflict. Another painting by Domenico Induno combines a genre work with a historical work about the fight for Risorgimento. 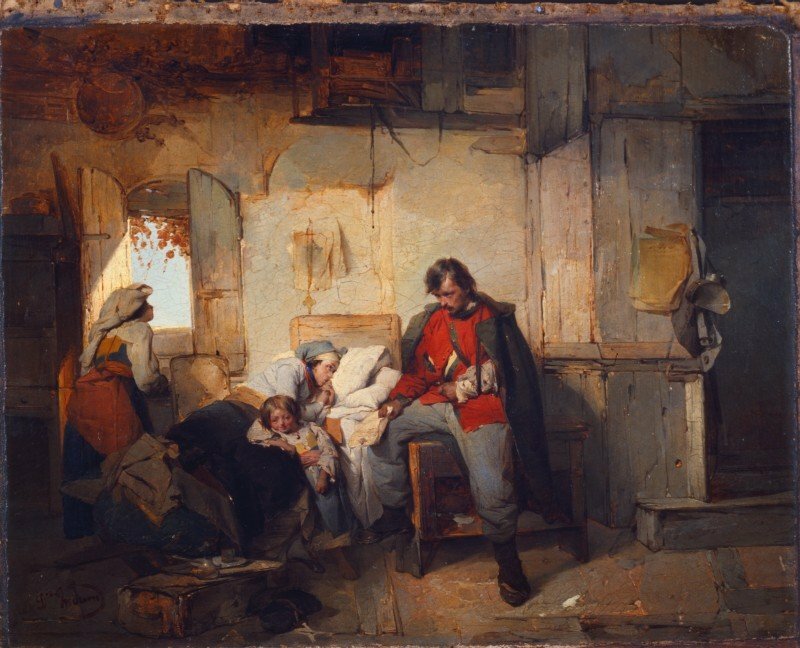 It is entitled The Return of the Wounded Soldier and was completed around 1854. Induno depicts a soldier sitting slumped in a chair at the bedside of his wife. She, like him, does not seem to be in the best of health. A crucifix on a ribbo0n hangs above the bed head. 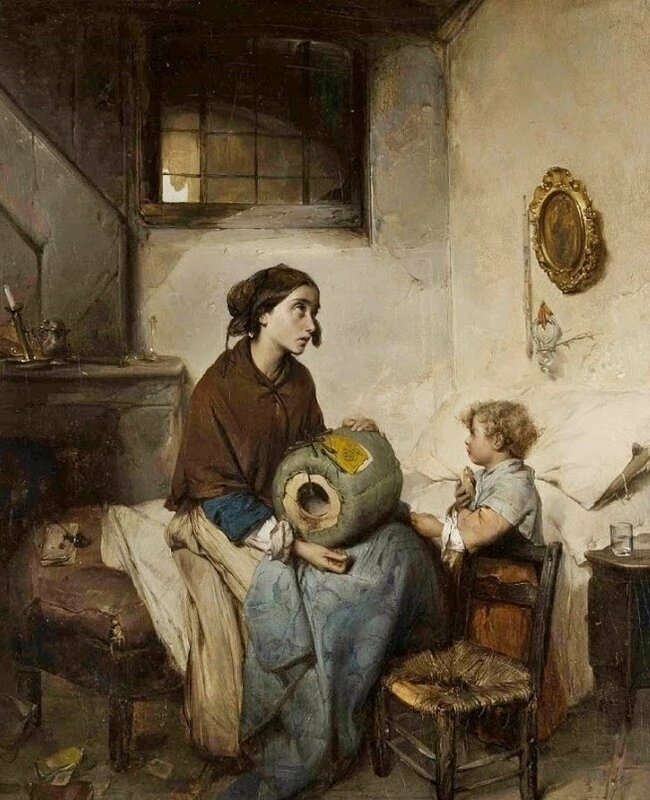 Their young child stands forlornly by her mother’s bedside. Their home exudes an air of poverty. Paint is peeling off the walls. Light streams through the open window and illuminates the soldier’s red tunic. A woman anxiously looks out of the window maybe a doctor has been summoned and she awaits sight of his arrival. The war has taken its toll on the family and although the soldier has managed to survive the many battles, his and his family’s future looks bleak. This is a genre painting which has a strong element of realism. This is not a work of art glorifying the Risorgimento but one which pictorially narrates the suffering and the sacrifices made by the ordinary people during such a cause. 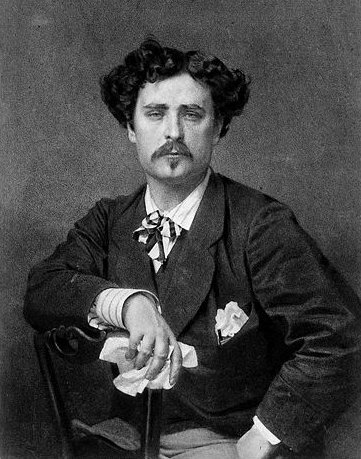 Domenico Induno died in Milan in November 1878 aged 63.